Copa Del Rey “El Clásico” Matchup Is Most-Watched Program Among Spanish-Language Sports Cable Networks. MIAMI, FL – February 12, 2019 – beIN SPORTS today announced key ratings wins following the highly anticipated Copa del Rey semifinal “El Clásico” matchup between rivals FC Barcelona and Real Madrid, which aired in the afternoon on February 6th live from Camp Nou Stadium in Barcelona, Spain. According to Nielsen Media Research, the broadcast reached 820,000 total viewers (P2+) across both networks during the premier. Marking the first El Clásico event to take place over the course of one month, the exciting Copa del Rey semifinal match aired February 6th kicking off at 2:55 PM ET / 11:55 AM PT. 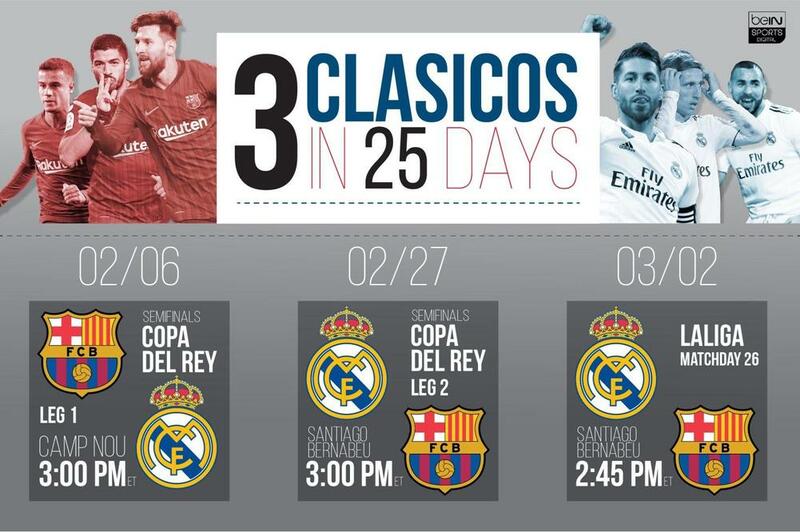 Viewers can also tune-in to the next two El Clásico matches to be held at Santiago Bernabéu Stadium on February 27th, and days later on March 2nd live on beIN SPORTS, beIN SPORTS en Español and streaming on beIN SPORTS CONNECT. Copa Del Rey “El Clásico” 1st Leg Match (Barcelona vs. Real Madrid) was the most-watched program among Spanish-language sports cable networks among all key demos. Launched in 2012, beIN SPORTS offers viewers world-class sports content and entertainment across multiple platforms including TV channels beIN SPORTS and beIN SPORTS en Español and live streaming on beIN SPORTS CONNECT. A cornerstone of beIN SPORTS is its unrivaled live soccer coverage, which includes live matches from LaLiga, Ligue 1, Copa Libertadores, Copa Sudamericana, Recopa Sudamericana, Copa del Rey, Coupe de France, Turkish Süper Lig, as well as news and in-depth analysis of all the top leagues from around the world. In addition to soccer, beIN SPORTS serves as a haven for fans of motorsports, tennis, boxing, mixed martial arts (MMA) and volleyball, among others. With the addition of Conference USA coverage, beIN SPORTS broadcasts College Football, Men’s and Women’s Basketball, Soccer, Baseball, Softball, and Volleyball. Through beIN SPORTS CONNECT, authenticated subscribers can also enjoy all the exciting action from the two networks and stream live overflow matches offered in HD on your computer, tablet or smartphone. For more information, visit www.beinsports.com.